The Kansas City Royals for most of their existence have not had a great amount of success. A few spans here and there have produced some playoff appearances and one prior World Championship. The last two years have brought sustained success to Kansas City and of course this years World Series trophy. Thirty years in between championships is a long time for fans to endure. Something had to change along that way to help them reap the rewards of being champions. Today’s book shows the world what things changed in Kansas City to help produce a winner and it may not be exactly what you think it was. For many years fans of the Royals really did not have much to look forward to. The promise of each spring eventually brought to fruition another 100 plus loss season. Realizing they were spinning their wheels, ownership decided it was time to make fundamental changes to the organization and bring them back to their winning ways. Ownership found their man in Dayton Moore. Bringing him in as General Manager was their first move in restructuring the entire organizational culture. This book takes a look at the way Moore helped formulate a winning culture at all levels and build the team up from within. Normally a book like this you would figure would be about just building the on field product. But what is different in this one is you get to see Moore’s management approach from a business sense, how he handled people on an individual basis and how important it is for everybody to believe in the system and buy into the entire approach. It shows a more human side to the business of baseball and how these same sets of skills can apply to everyday business. Now not lost in the shuffle is the baseball team. There are plenty of stories of how through trades and draft picks they were able to become one of the strongest teams in the league. Moore tells stories about Ownership and their dedication to winning both on and off the field. It really gives you a glimpse of what the Royals have actually pulled off. So many years in the making, if you were not paying attention to the Royals at the time, you may have missed the signs of great things to come. Baseball fans should check this one out. It is a very unique view from upper management and an approach that has worked very well for both management and fans of the Kansas City Royals. In Baseball you always have to stay one step ahead of the competition. Both on the field and behind the scenes that same principle applies. You need to find the edge to beat your competitors because even if you keep the status quo, in reality you are falling behind. Sabermetrics and the Moneyball theory have turned baseball on its head and changed the way teams address their needs. So who really started that revolution and is it really a good thing after all? Sandy Alderson is the current General Manager of the New York Mets and the man in charge of reviving that struggling franchise. While all has not been golden in the Mets re-birth, he has done a commendable job in restoring some dignity to the franchise. But is Sandy Alderson really the baseball genius everyone says he is, or is it just sometimes thinking outside the box that gets him some acclaim. That is what Baseball Maverick tries to figure out for the reader. The book starts with Alderson’s upbringing and distinguished military career. It paints a nice picture of a man with courage and dedication. Two traits that come in very handy in the baseball world. You follow his professional career starting with the Oakland Athletics where he mentored current GM Billy Beane. It shows how Alderson got his reputation for thinking outside the box in regards to evaluating his team. Many of these ideas were born of necessity due to ownership and money constraints. It is during this stop in his career that Billy Beane gained most of the knowledge that he uses running the Oakland A’s. The next stop for Alderson was San Diego where he again got the team back to respectability, but was unable to pull of a World Series triumph. After the Padres he put down roots with the New York Mets. Hi current home of Citi Field shows the reader in-depth how he has attempted to turn that franchise back into a winner. Attempting to overcome the Madoff scandal that has handcuffed the team financially has been an obstacle he has had to figure out how to overcome along with some bad player deals of the past. The 2015 season has brought them hopefully the start of lasting success, along with players they have developed finally reaching their expected potential. 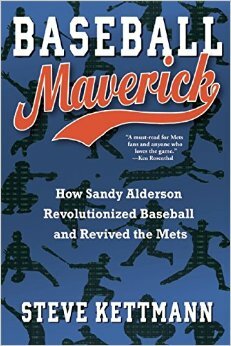 After all this is Sandy Alderson the Baseball Maverick the book suggests he is? My thought is no. While he is a very talented General Manager, he is not the reason that Oakland has been able to compete on a shoe string budget. Billy Beane has been able to work with some of Alderson’s fundamental ideas and make them his own. That is what has made Oakland a success. Alderson may have planted the seed, but Beane made it grow. San Diego has been up and down so many times since the start of Alderson’s tenure there, that they should be a roller coaster not a baseball team. Finally the Mets were a train wreck when Alderson signed on, and it has to his own admission taken much longer for that team to make a substantial turn around than even he anticipated. The book tries to make it seem that Alderson is responsible for the birth of Moneyball theories and I just don’t see that connection to just him. I see pieces of it in the way he has operated at certain stops, but it is a far cry from him being the one that designed it for the world to use. That being said, this is a very well written and entertaining book. It keeps the reader’s interest but it is very Mets heavy in subject matter. Sandy Alderson is almost a mystery man in the baseball world. He has always worked behind the scenes and low-key, so this book gives you some insight on his personality. Again, I don’t agree with the Maverick term in the title, but he has made some substantial contributions to his teams and the game as a whole. Mets fans will love this book, and general baseball fans will like it. It gives us a glimpse of the man behind the curtain once and for all. There are certain people in baseball that when you mention their name you can get countless things that they are remembered for. Jackie Robinson and Branch Rickey are two such people who are remembered for various things of monumental proportions that changed the game we love. From the integration of baseball to the development of farm systems they both left the game in a better state than when they arrived. Today’s book takes a look behind the scenes of their biggest and best remembered project the integration of baseball by a writer who witnessed it first hand. When I saw this book my first thought was why do we need to go down this road again? Have we not covered every angle as to what transpired leading up to the implementation of the project in 1947? It has been almost 70 years since this happened, so what stone was left unturned? Yes it is possibly the biggest single event in all of baseball in the 20th century and something we as a society should remember for both its social and historical value, but why now? Roger Kahn is an accomplished and talented writer whom I enjoy reading his work. He has created a book that recounts the historical events of Branch Rickey’s project, and shows events that someone without first hand knowledge may not have known. Kahn recounts conversations with Dodgers management, other writers and people he associated with at that time. Bits of information that may have been inadvertently left out of the story at the original time or maybe on purpose, I’m not quite sure. The conversations he is recalling in this book are with people who have passed away, so there is no real basis to refute the private off the record conversations that Kahn has had with others. The reader is left to decide how much faith the have in Kahn ethically and did these conversations really ever happen? If you take the book at it face value and accept the stories he tells as fact, then the book becomes an enjoyable first hand account of a historical moment. If you look at the aspect that Roger Kahn is the last living person involved in all these conversations, and then question the accuracy of comments, then you will ruin the book for yourself. Being Kahn’s self-proclaimed last book, I am not sure how to take the conversations. I can see the book from both sides of the fence, but would like to think after all these years of reading Kahn’s writing that there is no reason to even ask the integrity question. Baseball fans need to read this and form their own opinions. It may be hearsay to some degree if you look at the book from that aspect, but it still is an enjoyable read from the history standpoint. Also as Kahn’s last work it does have some historical value in its own right due to that fact. Baseball is full of storied careers. With the passage of time, some of the stories become bigger than life. Some of those careers get clouded by the haze of nostalgia, or the feeling of what we used to have is better than today. Todays book takes an honest look at a high-profile career and gave me a clear look at what really happened. Paul Richards mark on baseball is undeniable. There are many things, by design or perhaps by accident, that have been attributed to him. Pitch counts, five man pitching rotations, tracking on-base percentages, his fingerprints are all over baseball today. What you don’t always see is the way the mind operated during his lifetime dedicated to the sport. Warren Corbett wrote a book almost 25 years after Richards death. Relying on family memories, notes and audio recordings that the family had provided, and has given a seldom seen side of Paul Richards. He delves in to the devious side of Richards and his dealings with players and management during his illustrious career. He also creates an accurate feeling that he was a hustler to many, both on the field and the golf course. The most interesting aspect of this book to me is the trouble Paul Richards had bridging the generation gap. When I say generation gap I am talking about the gap that was created near the end of his career in the dawn of free agency. Richards had a lot of problems accepting the birth and subsequent power of the MLB Players Union. It shows how after almost 50 years in baseball he was very set in his ways. While after finding moderate success on and off the field in all his stops in baseball, Richards was a man of many friends and able to work the old boy network to his advantage and always find work. That may be some of the reason he was not interested in adjusting to the new era of baseball. The book is very heavy in detail about his time in Baltimore with the Orioles. It was the longest stop of his career but still dominates about half of this book. His stops in Houston, Atlanta, both stops in Chicago and finally Texas seem to be condensed versions to fit in the book. I think a little more time could have been spent in Houston alone, due to the challenges of building a new franchise. In the end Richards does not come out of the book looking like the genius he is regarded as today. He seems almost human and to an extent skating through some of the stops in his career. The end result of the book has shown us what I feel is a very fair and accurate portrait of Paul Richards. Wayne Corbett did a great job on this biography especially since he was doing it almost 25 years after Richards death. There are several teams within Major League Baseball that just get no respect. Sometimes the reason may be their own ineptitude, financial shortcomings or even as simple as being a group of unlikable guys. Teams that come to mind are the Miami Marlins, Washington Senators, Philadelphia and K.C. Athletics, Minnesota Twins and Houston Astros just to name a few out there. They all have their place in history and it is not always negative. The loyal fan bases that these teams maintain always hold out that glimmer of hope for next year and the fortunes that may come their way. Todays book takes the time to celebrate one of those team that struggles to be respected. The Houston Astros were born out of National League expansion in 1962. Originally named the Colt 45’s, they started play with a bunch of over the hill and wet behind the ears players. They spent more than a decade languishing near the bottom of the standings before reaping the fruits of their labor and becoming perennial contenders for the fans of Houston. Unfortunately like most things in life, baseball standings come full circle and the Astros are rebuilding for the future once again. 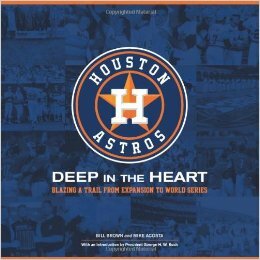 Bill Brown and Mike Acosta have compiled a book that shows the pride the fans of the Astros have in their beloved team. They show that you don’t always have to meet prettiest girl at the dance to find true love. Like most teams that have a loyal following, the fans of Houston are proud of their team and its heritage no matter how they finish. This book is really great. It has 11 different chapters and breaks the 50 plus years of Houston baseball into each. You learn about the stadiums the Astros have called home. You learn about a variety of different players and off field personnel that have worn Houston’s colors proudly. Finally you see the Astros high points on the field, most recently being the 2005 World Series. One part of this book I though was interesting is that is it gives a glimpse into the future of the Astros, it shows rising stars they are hoping will propel the team to new heights. I also found that I had no idea who has actually played for the Astros during their existence. The Houston portion of some players career’s may have been short, but there were some big time names that hung their hat in Houston for a bit. The pictures in this book are of great quality. You get a chance to see some never before seen shots that make you feel like you were there. I for some reason wish I had the chance to see a game at the Astrodome, but never did. So I always like seeing old pictures of the eighth wonder of the world, and this book does not disappoint at all! 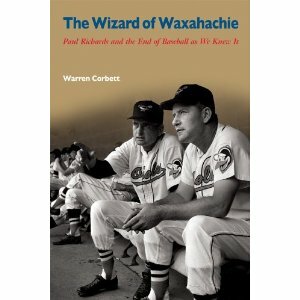 Astros fans will love this book. Fans of team history as well. Books like this always have a place in our bookcases. They allow fans to go back and relive the memories they have and add that special nostalgic magic to it. As we all know that nostalgic magic can make things seem better and more enjoyable than they really were, but sometimes we all need that in life. Also when you order this book it arrives with a bag of baseball candy and a bag of Cracker Jack in the box. What is more enjoyable or nostalgic in baseball than Cracker Jack???? 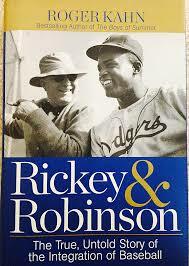 Through the years I have read several Branch Rickey biographies. Some of those were good and some not so good. Unfortunately this book falls into the latter category. 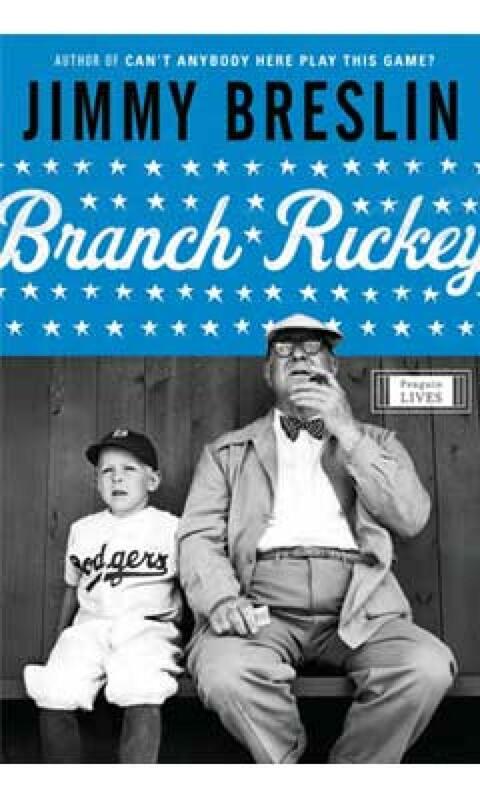 Branch Rickey-A Life has several flaws, at least in my opinion. Since there have been so many Ricky biographies published, one would hope at least the common factual information would be correct. I am learning now that Breslin may not be one of my preferred writers to read. Perhaps its his writing style, or the fact that these are very short books he writes. You don’t get the chance to read in any great detail, any of the information in his books. Regardless of the subject matter he seems to have a 150 page limit to tell the story. Within those 150 pages you are only able to briefly immerse in each topic, and as we all know Rickey is a story that is very complex. In the end what you get with this book is a very basic biography about the man. It is almost a warm and fuzzy rendition of Branch Rickey and left me wondering why did we need this. Almost Fifty years after Rickey’s death and Seventy years after the birth of his great experiment, the reader expects much more. After plunking down your hard-earned money to buy this book I feel safe in saying the reader deserves more as well. As I said above maybe I am the issue with Breslin’s writing style. I just didn’t get what he was trying to give the reader in this book. If it was geared towards a juvenile audience it would have accomplished its goal much better. But as a Biography on a large figure in the baseball realm, it failed miserably. I had the same problem with Can’t Anybody Here Play this Game, also by Breslin, but learned after the fact it was some sort of compilation of articles manifested into a complete book. I don’t think that is the case here. I really feel that this book just totally missed its mark. I think most readers will be disappointed with this book, especially seasoned baseball readers……..but you be the judge, I am just one opinion.